A more popular car will have better servicing as parts and skills will be common. A fast car is compelling but sometimes speed is easily sacrificed for comfort. 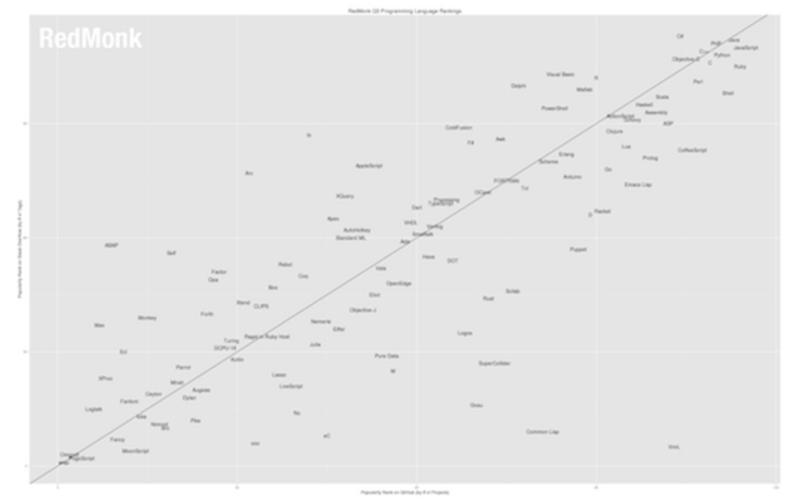 The question of language efficiency verses productivity has been nagging me. The nagging question includes what languages, frameworks and packages are best for collecting data, analyzing data and exposing the data in a rich UI via a web browser. 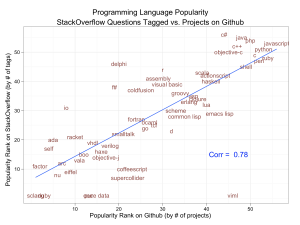 It is a huge decision to make at the beginning of a project as to which language to use and why. 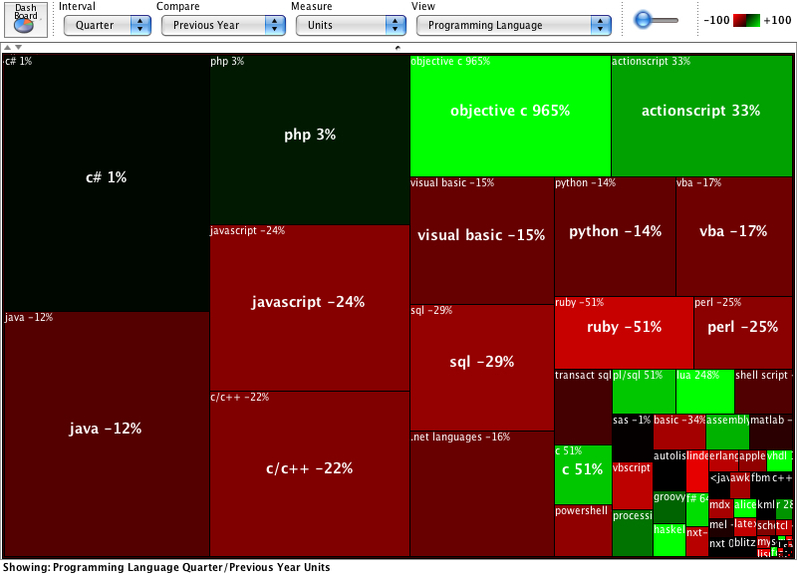 Productivity is probably the most important factor when choosing a language. 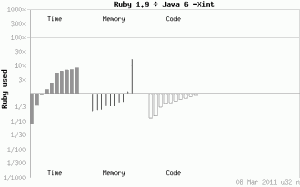 As the founder of Slideshare, Jonathan Boutelle, said when asked if he regretted using Ruby instead of Java inhis response was that the question was moot, that he wouldn’t even be there talking if he had use Java. 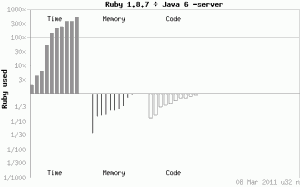 Sure Java would have scaled better and Ruby had concurrency issues but Slideshare would not have succeeded, at least not as fast, or possibly not even existed had they used Java. 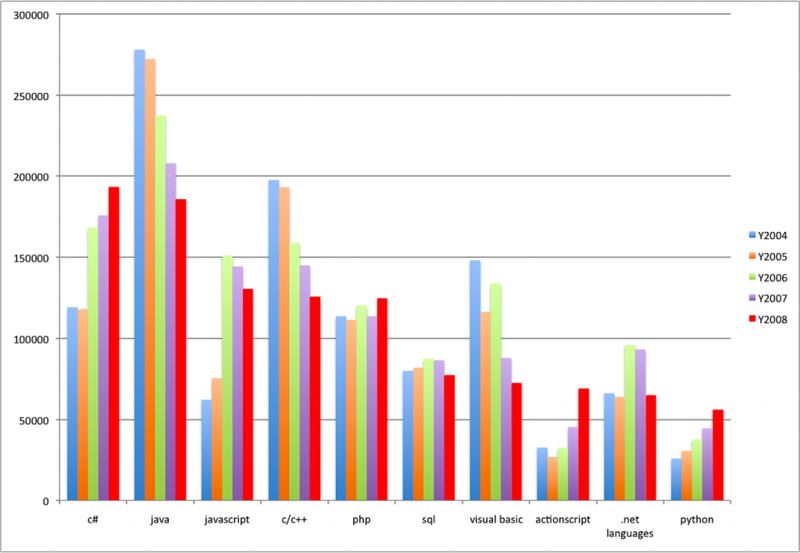 Now the above graphic might be hard to read (wish it was larger) but what it is indicating is that Python is roughly 10x times slower in execution time to than the equivalent programs in Java. 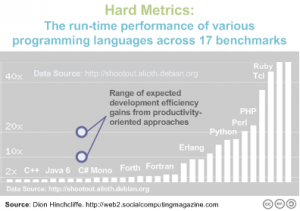 On the other hand the expected productivity gain for a programmer is 5-10x faster in Python than Java. 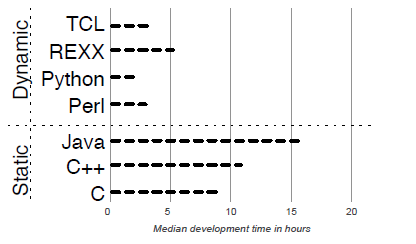 Now on the surface my reaction is “OK, it’s faster to program in Python, ok, but Java is 10x faster so it’s clearly the choice!”, but if I put the numbers into real life I’m like OMG – imagine a Python program that takes 1 day to write, now that same program would take 5-10 days in Java!? Thats a huge deal. 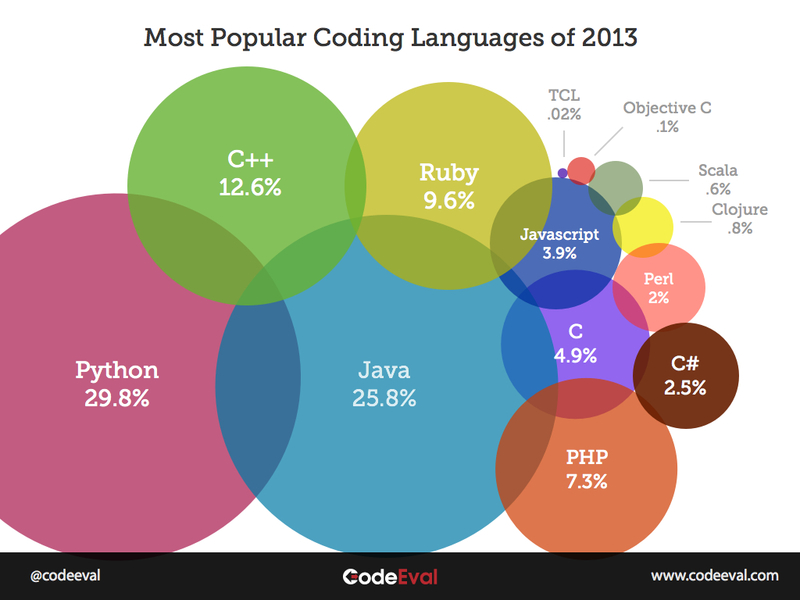 Hands down, I’m going to program in Python (or something other than Java). I can deal with some runtime performance issues. 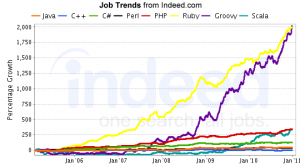 Should a company program in Java or Python? 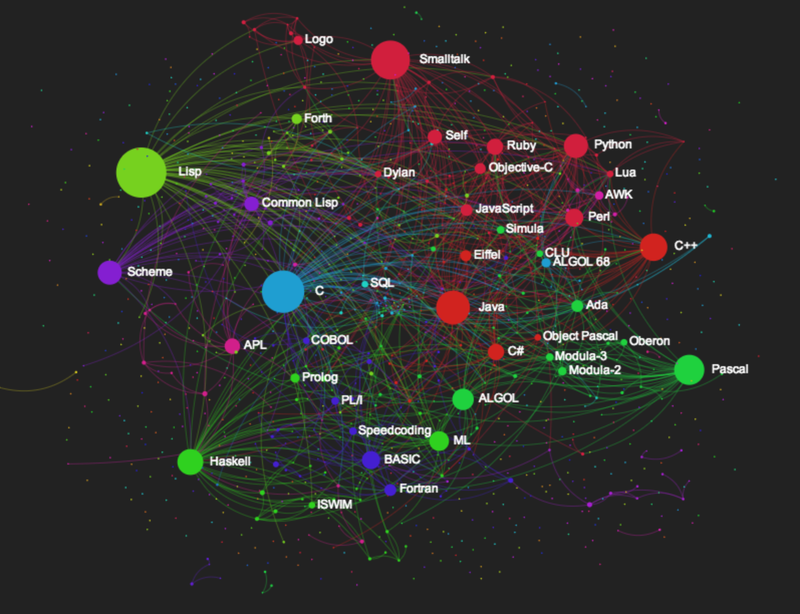 What if Python would take a year to bring to market? 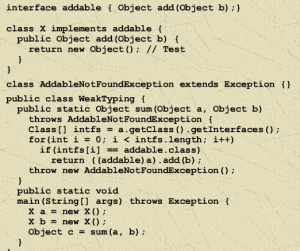 What if the Java verisontook 5-10 years ?! 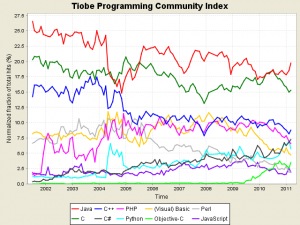 (Interesting to all the Oracle folks: PL/SQL shows a 51% growth 2007-2008. 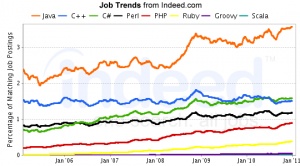 Current speed might be a bit misleading as popularity will impact the efforts put into the issues of a language and a language that is popular though maybe less efficient will see improvements, for example it’s interesting to see the improvements in Java over the years, and now to see the improvements in Ruby. 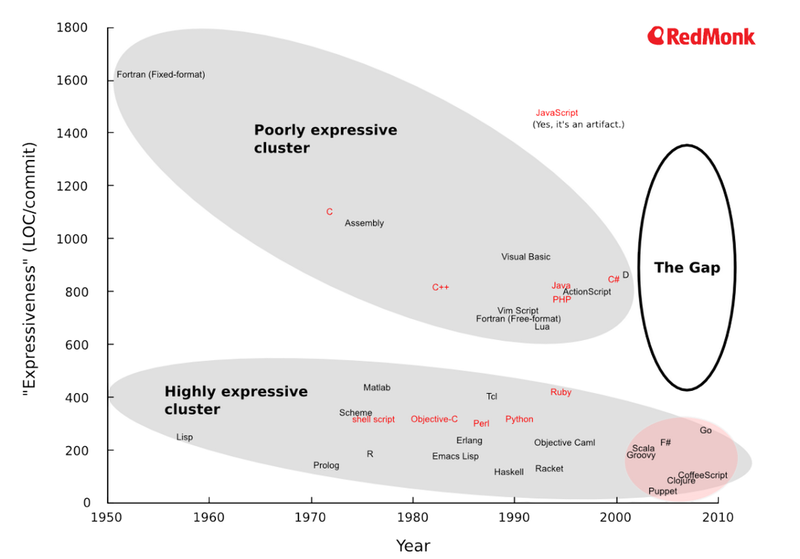 Though Ruby is slower than Scala and Scala’s productivity may even be better than Ruby, Scala doesn’t, yet, have the market momentum, thus the assurances that it is a language to invest in now. Also if speed of the language is an issue the solution is not to throw the baby out with the bathwater, ie throw out the productive programming language altogether and go for a fast one such as C or JAVA but to find the areas of slowness in the productive framework and replace those with a fast function in another language, ie polyglot programming.